Went out on my long jogging route, the roads of Juba Town already busy. Rafa and Blackie, the dogs from the UNOPS guest house, joined for a bit which was fun. The traffic meant that for sections of the road it was like running through a dust storm. The churches were in full voice and street vendors had their fires going, the first patrons waiting. 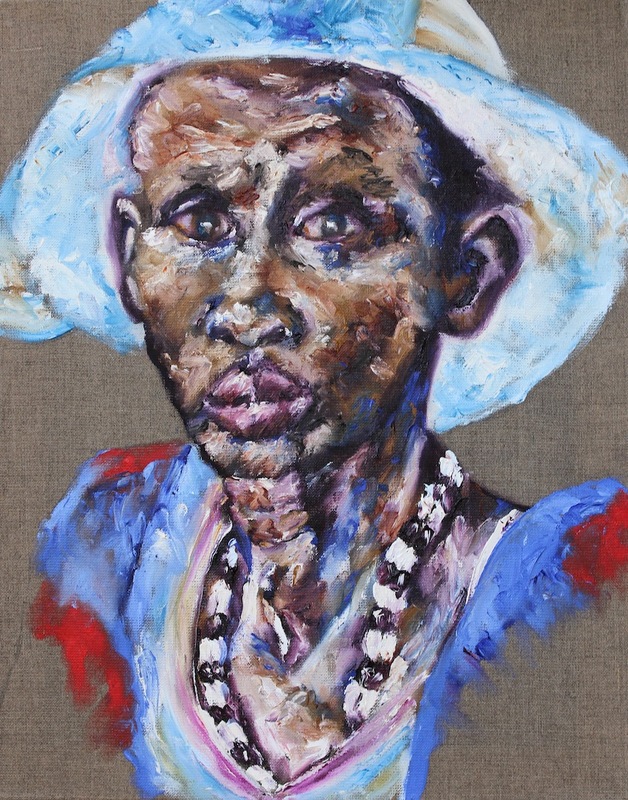 My painting ‘I Have Seen it All’, of a woman in Aweil, South Sudan. She was turned out to meet the Director General of DFID, adamant that she was going to have her say about needing education for mothers. Her intensity, sparkling. Woke early with shots somewhere in Juba Town. With all the unrest in Jongelei, and the shots, I decided not to head out for my jog in the dark. Probably unnecessarily cautious. The usual mix of South Sudan craziness. One staff member caught up in the Jongelei fighting. Fortunately not close to where the incidence took place. We had a contractors truck set alight by the guys who have been causing all the drama. The driver and his assistant fled into the bush and we are trying to locate them. Summer has decided to arrive with a vengeance, temperatures heading into the 40 range. The generator at the apartment decided to quit working sometime during the evening, which gave the aircon – which had been working its heart out – a break. Still battling to get any assurances that there is a plan to provide water through the dry season to the refugees in Maban. The outbreak of Hep-E is spiking, and dwindling water availability potentially catastrophic. Last year we managed to keep tankers running, but this year there are too many people, we don’t have the funding and we are moving our resources to deal with the Yida crisis. I’m sending a couple of teams up this week to try and get some answers. Not our responsibility, but it will become our problem! Opening of Kiden Kelle art exhibition in Juba Town. An amazing amount of work, creating textured pieces in paper mache from recycled materials. I ended up in the wrong place in the room, next to the artist who I had no clue about, and hence, all the protocol stuff happened with me in centre stage! Pizza and red wine next to the Blue Nile, with the Da Vinci Jazz Band playing. Not bad for valentines evening in Juba Town! The weather was mild, the service good, the sound from the band dreadful and the company entertaining and enlightening. They had put out red baloons, there were roses on offer and all the staff were in red and black, as were most of the people who kept arriving. Getting out from the car park was chaotic, with a queue of vehicles waiting to get access. Glad we went, and left early! The solar powered street lights around Juba Town have been a disappointment, with most dark as I go out for my jog. Having twisted my knee in one of the spots that was slightly darker than the black surrounding it, I have been using my headlamp to avoid further injury. Amazingly, I have discovered that the street lights have light sensors and only switch on when a vehicle or jogger, with a headlamp, approaches! A bunch still don’t work even then, but some do.